Leaders and families gather to celebrate WASH in Uganda. Lifewater staff, families, teachers, government officials, and religious leaders gathered together yesterday to officially launch and celebrate the WASH program in Bwiite, a community in Kaliro, Uganda. The Kaliro program will serve over 30,000 people living in this eastern region of Uganda with access to safe water, improved sanitation, and hygiene education. Kaliro, in eastern Uganda, is a semi-arid district with patchwork grasslands and forests, where many families farm or herd animals for subsistence. Very few people have access to safe water, sometimes waiting six hours in line at a well, and nearly half of residents collect surface water from a ditch or pond. Open defecation is commonly practiced. 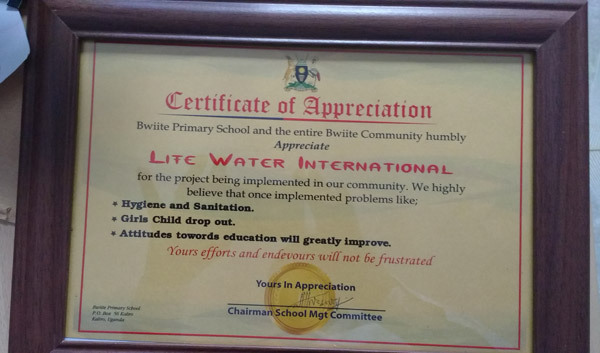 In Bwiite, a remote and underserved community, Lifewater will help the residents access safe water, build school latrine blocks, and guide WASH in Schools and Healthy Homes programs, which help students and families practice hygiene behaviors that improve health, help kids stay in school, and demonstrate the communities’ ability to enact and sustain WASH solutions. Officials from the local government, including a representative from the Ministry of Water, a local pastor and sheikh, and primary school officials all expressed their support for the efforts ahead. The pastor shared the story of Jesus and the Samaritan woman at the well from John 4. Lifewater WASH facilitators also performed dramas about Healthy Homes to help spread the knowledge of what households can be doing to immediately improve health and stop the spread of disease.